A guide to realistically make small changes in the kitchen to benefit the world. A small change can make a big impact. If you missed part 1 of my practical guide to saving the world from your kitchen go here. There are 2 main reasons to eat meat free on one day of the week, the planet and your health. Environmentally choosing to eat meat free on at least 1 day of the week helps to reduce to pressure on our farming resources. It’s also great for your health to boost your wholefood intake. 7. Shop at a co op food shop or bulk food health food. Take your own jars and cotton bags to fill. You can save money buying in bulk and reduce the amount of times required to head to the shops. Reduces house hold rubbish through excessive packaging. There is potentially a reduction of plastic bags going to landfill. Between my worm farm, compost and our 2 food obsessed Labradors, I have very little food wastage. If you space and pets are a problem for you I recommend a worm farm. They are cheap (you could always make your own), they are compact. I’ve had a worm farm now for at least 4 years, and I wouldn’t be without one. I’m not very kind to them, I feed them our off cuts, our left out and forgotten veggies, used tea bags and coffee grounds, all the hair from the dreaded kids hair cut, newspaper, organic fabrics like cotton and hessian, all things organic, except meat, citrus and onions. A worm farm is basically a condensed compost bin with a high worm ratio. If you have the room a compost is another great way to to turn your scraps into something that is extremely useful and beneficial to the earth. They are a great way to get kids involved. They love the worms and are happy to go out and feed and dig around for them and watch them wiggle in their tiny hands. There is life in that black box and dirt, and kids are instinctively drawn to both. But there is a world beyond the worms and the dirt, one of microscopic microbes and fermentation both that are super beneficial to your garden. This secret non visible world thrives in the castings left by the worms or in the worm tea, the liquid that is collected at the base. Both make there way onto my produce gardens to work their microscopic wonders on the plants. We have become accustomed to using specific cuts of meat and therefore adding huge pressure on our lands with the shear number of animals required to keep up with supply. There is also a greater wastage as the lesser cuts of meat are not required and often making there way into pet food. Don’t let the the word “lesser” fool you, these cuts are generally, richer and more flavoursome. Some require long cooking, but some require very little cooking at a high heat therefor making them an outstanding BBQ meat. But whether cooked long and slow are fast and hot there is one thing in common, they both have a reduced price tag over the traditional cuts. So save your self some money, give your taste buds a present and help relieve the pressure on our resources (such as land, water) and purchase some lesser known cuts of meat. My tip, find a great local butcher that butchers onsite and has good knowledge of how to use the lesser cuts, not all butchers do. 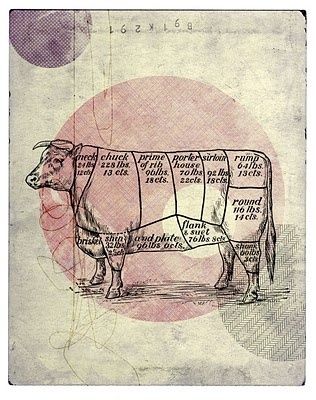 You might also find that small domestic butchers refer to cuts differently to the cooking community. Fats and oils wreaks havoc on our plumbing and environment. If you are to discard your fats pour it into a vessel lined with paper towel and once set place into your rubbish bin. But also remember not that long ago drippings, the fats left behind after roasting some meat or making stock was spread on fresh bread and eaten happily and whole heartily by choice. Also chicken fat removed from stock or from a roasted chicken makes excellent roasted potatoes. Julia Child the pioneer American Cook recommends Bacon fat to boost flavour when sauteing onions for braises. I keep dripping in the freezer in portions for boosting flavour. Do you have any personal kitchen focused world saving ideas or methods? Feel free to share.